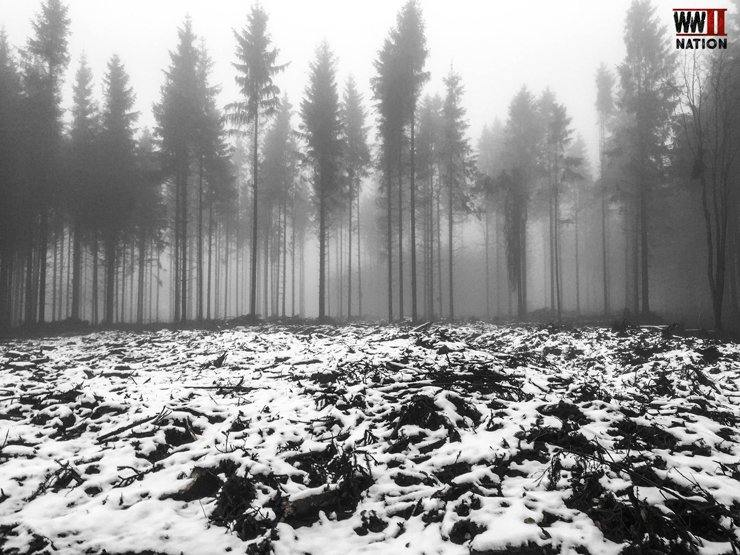 It was a very early start to Day Three, in rather damp and foggy conditions we made the long journey North to the area known as the Northern Shoulder, where Hitler had placed his strongest and best equipped forces – Sepp Dietrich’s 6th SS Panzer Army – as his main thrust for the Ardennes Offensive in the hope of a quick break-through to the River Meuse, and then ultimately Antwerp. 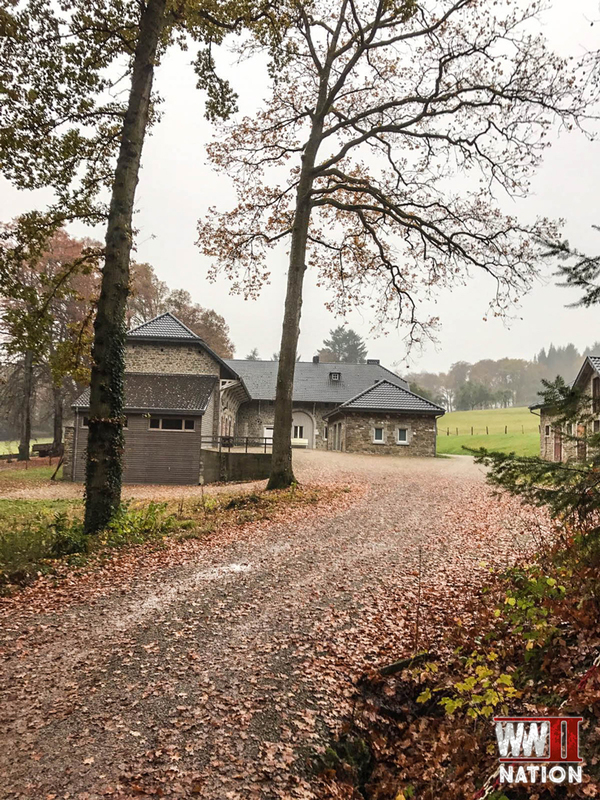 Following on from our day visiting a few of the locations in and around Bastogne connected with the siege and the 101st Airborne Division’s defence of this vital regional road juncture (which if you missed Day Two, you can Read It Here), we turned our attention North. Day Three was an even earlier start than normal as we had a long drive to the north. 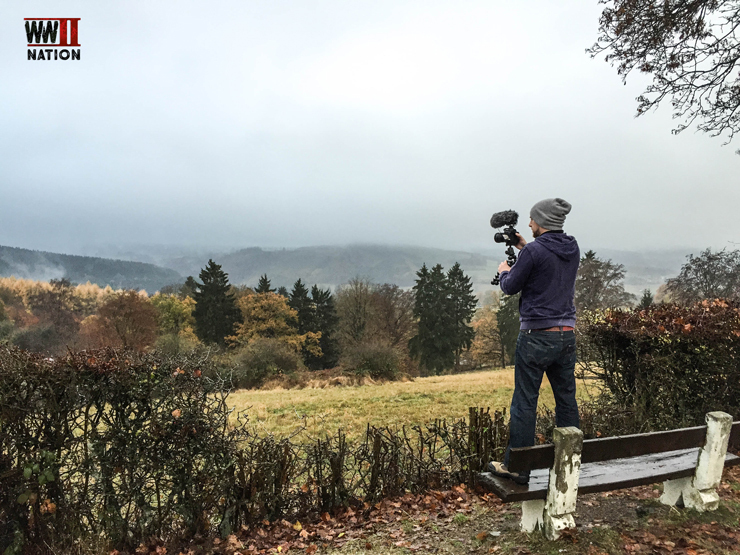 Along our scenic route, we had to stop off and film some of the incredible Belgian countryside. 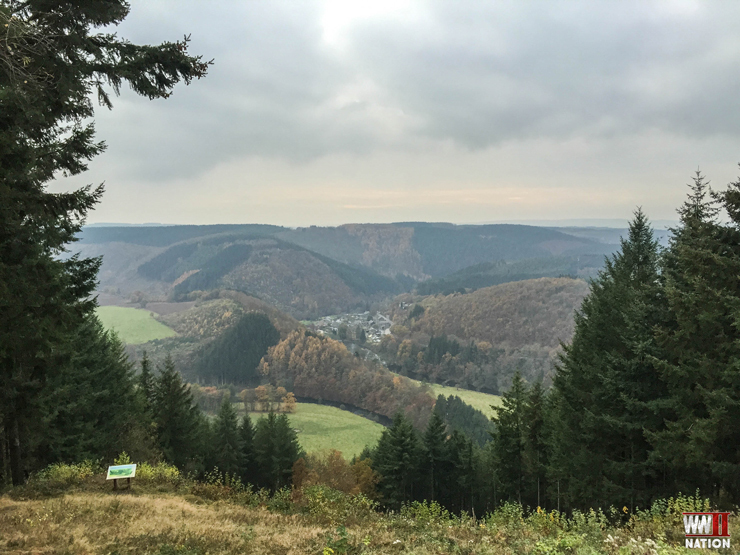 There are some amazing panoramic views and you can certainly see from this photo how the terrain through the Ardennes was not the most suitable for armour to advance through and why the fighting was going to focus so heavily around the road networks which were vital to the German’s plans. Nearby La Gleize is Le Chateau Naveau De Bra-Sur-Lienne the CP of General James M. Gavin the commander of the US 82nd Airborne Division. The All American Division along with US 30th Infantry Division played a crucial role in blocking and cutting off Germany’s main armoured thrust through this region by Kampfgruppe Peiper. 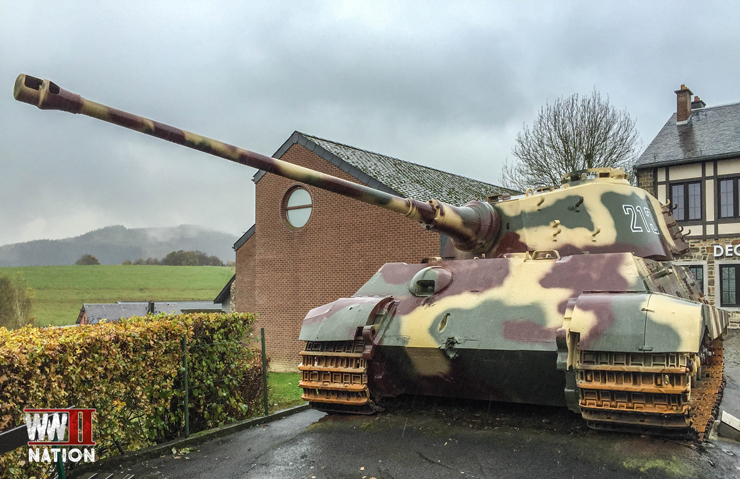 A relic and veteran that still stands as a reminder of the events that happened here in December 1944 is Königstiger (King Tiger) Tank No 213. 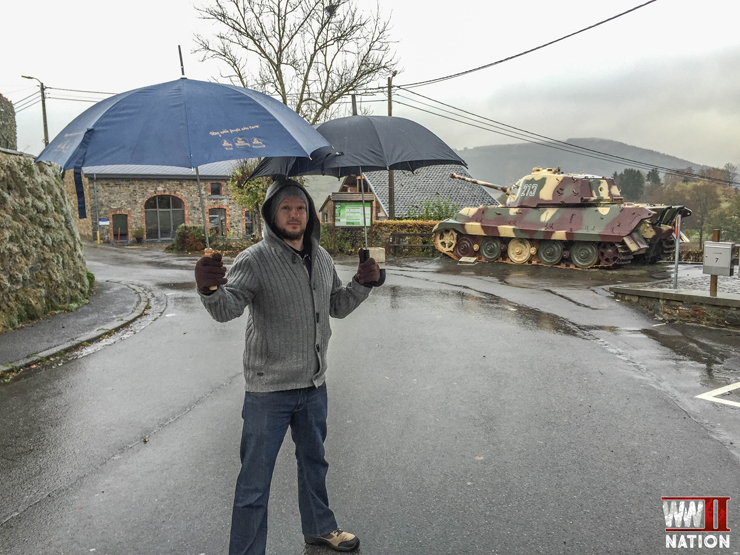 Once part of Obersturmbannfuhrer Joachim Peiper’s Kampfgruppe, this Tiger II Tank was caught up in the fierce fighting around La Gleize. 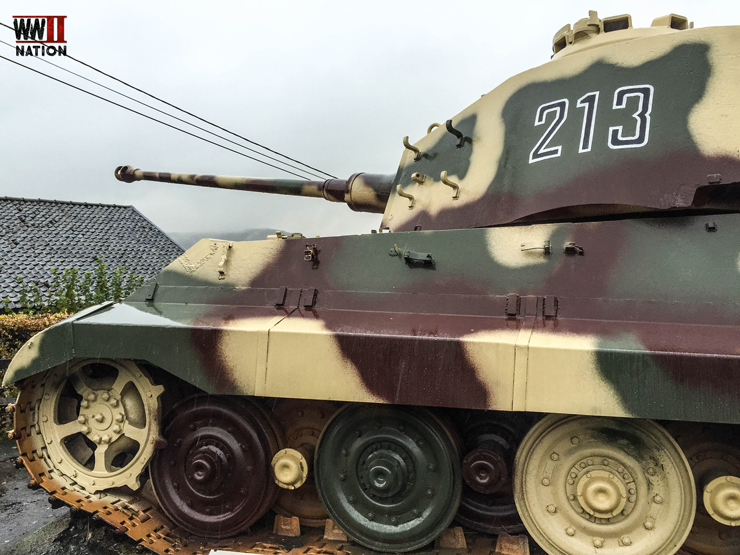 Around 50 King Tiger Tanks were used during the Battle of the Bulge. 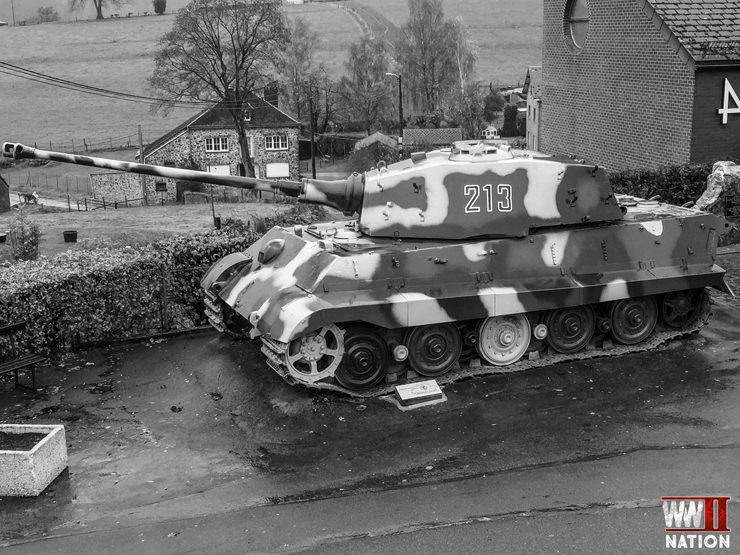 Peiper’s force had between 15-20 King Tigers which were serviceable for the Ardennes Offensive. It was remarkable getting up close to this colossal tank, which is truly terrifying in its scale. At over 12 feet wide, 10 feet tall, 22 feet long and weighing around 69 tonnes this was a monstrous vehicle to be confronted with. Not only did it have very thick armour, up to 180mm in places, it was armed with the lethal 88mm gun which could potentially knock out a Sherman before it could even get close to engaging it. Despite its firepower, sheer-scale and psychological impact, there were however of course drawbacks to this tank, mechanically complicated, cumbersome and a fuel guzzler – I dare not imagine how much a King Tiger would cost to fill up today. 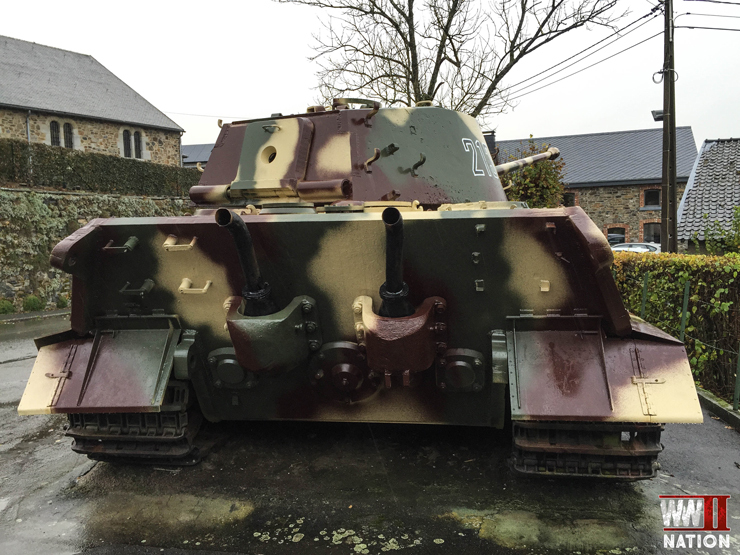 Interestingly Peiper himself was not a fan of the weapon, they were ill suited to his mission of speed, the windy Belgium road-network and many of the bridges in the Ardennes would be incapable of supporting their cumbersome weight. After repeatedly being frustrated by American units blowing up the bridges they crucially needed to continue their advance towards the River Meuse, Peiper was forced to pull his force back towards La Gleize. Here they were in for a tough fight as the 82nd Airborne Division and 30th Infantry Division slowly surrounded the German forces, repeatedly pressing their perimeter, subjecting them to heavy artillery fire and ultimately preventing reinforcements and supplies getting through despite other elements of the 1st SS Leibstandarte’s best efforts to the contrary. King Tiger 213 commanded by SS-Obersturmfuhrer Helmut Dollinger saw its last combat on 21st December when it was engaged in a fire-fight against 15 US tanks on the outskirts of La Gleize. In the exchange the Americans disabled the tanks main armament, blowing off a section of the gun and forcing Dollinger and his crew to abandon their tank. 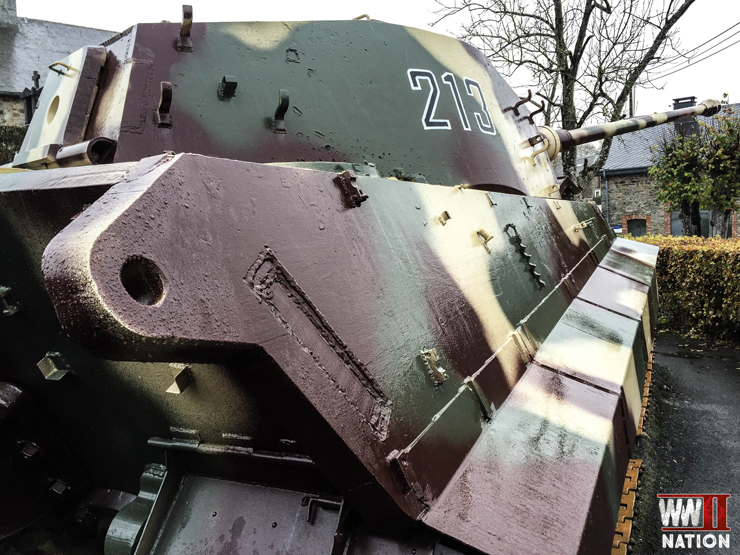 Finally with all hope gone and supplies dwindling to critical levels, on 23rd December Peiper gave the order to disable the remaining 135 armoured vehicles in La Gleize. 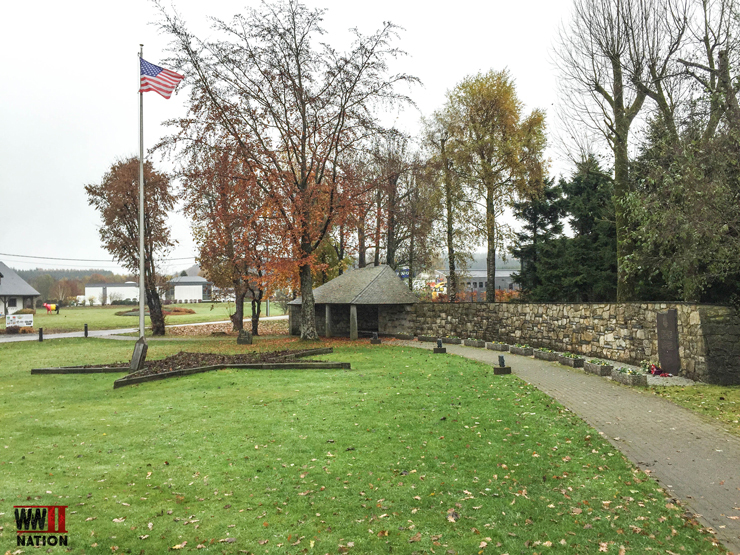 Then he along with 800 men and one US officer prisoner trekked on foot over night to the divisional HQ at Wanne, where they duly arrived at dawn on Christmas Eve. One of the places we passed on our way out of La Gleize was this house. 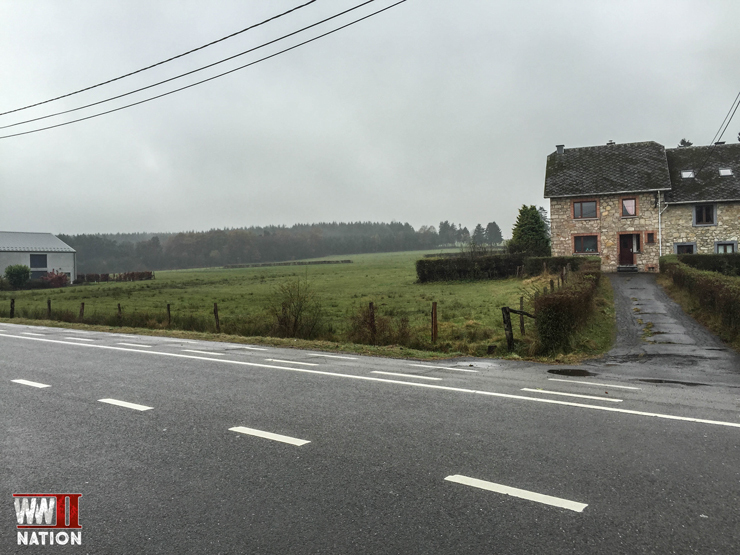 According to our guide Michel it was here that Peiper based his command post during the fighting for La Gleize. Choosing these outbuildings rather than the grand chateau / castle just beyond, as he knew the Americans would most likely suspect he would be there. Instead he placed any US POWs and wounded in the castle. 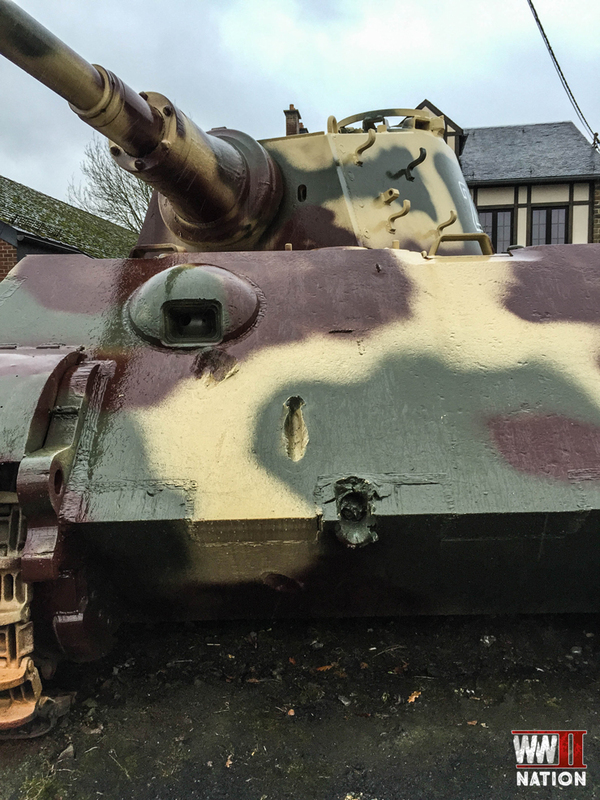 Despite the weather’s best attempts to sabotage our filming efforts we did manage to carry on and you will see King Tiger 213 up close and personal as well as find out how it managed to survive the scrap heap in our Vlog of our trip to the North Shoulder. As you can see I was left to take the photos and get soaked whilst Ross remained happily dry! From La Gleize we headed towards the German border to visit a section of the Westwall and see where the German attack began. But on our way we stopped off at the Baugnez Crossroads to see the site of the Malmedy Massacre. 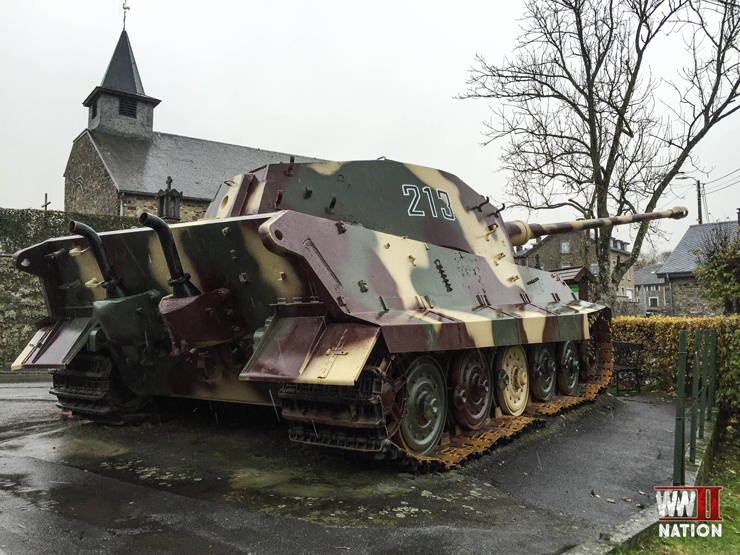 Just one of the atrocities committed by Kampfgruppe Peiper as they made their bloody march through the Ardennes. 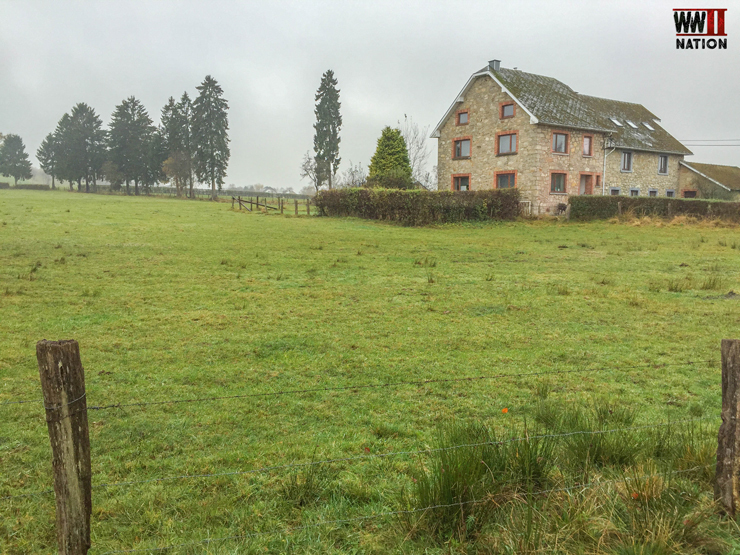 It was here on Sunday 17th December 1944 that the 1st SS Leibstandarte Division arrived at the Baugnez crossroads just before 1 pm and encountered, much to their enemy’s surprise, elements of a small US convoy from the 285th Field Artillery Observation Battalion who were withdrawing southwards. After a short fire-fight more than 100 GIs were rounded up and taken prisoner. They were searched and herded into a field at the crossroads. 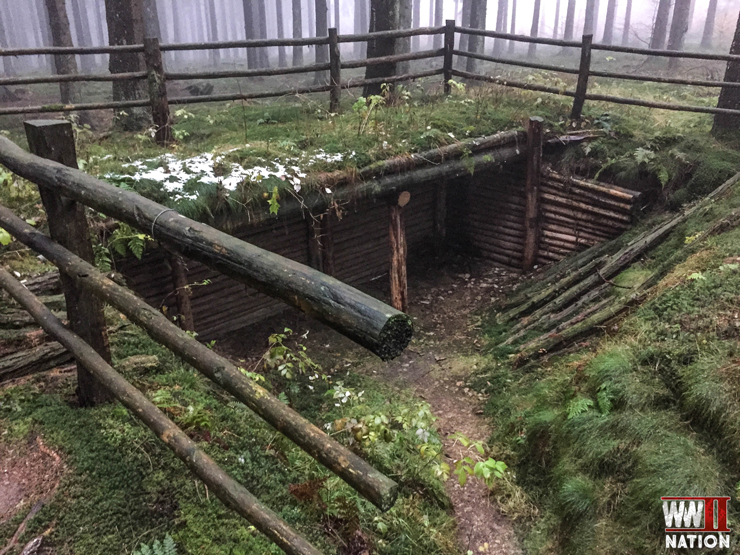 For whatever reason, and to this day it is still not 100% clear who gave the order to do so, but after 2pm they were fired upon by men of Peiper’s Kampfrguppe. 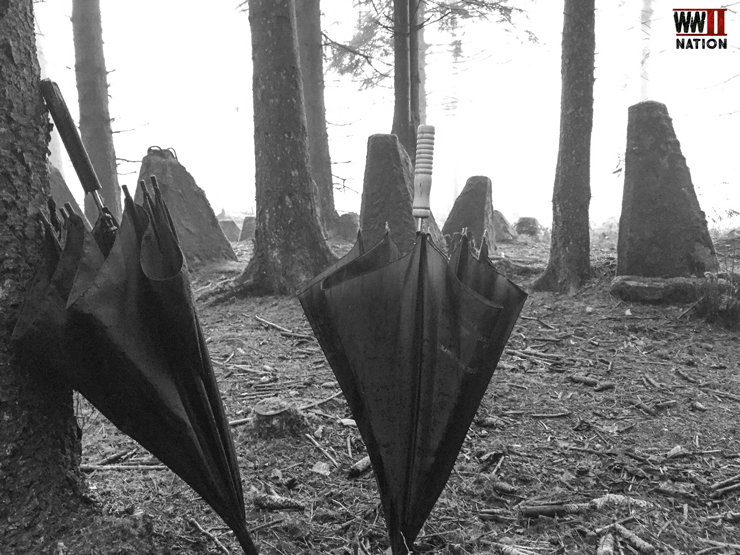 A few men did actually survive, feigning death and managed to escape. Very quickly news of this massacre of 84 GIs spread with the Allies media and newspapers very quick to report on what had happened here. 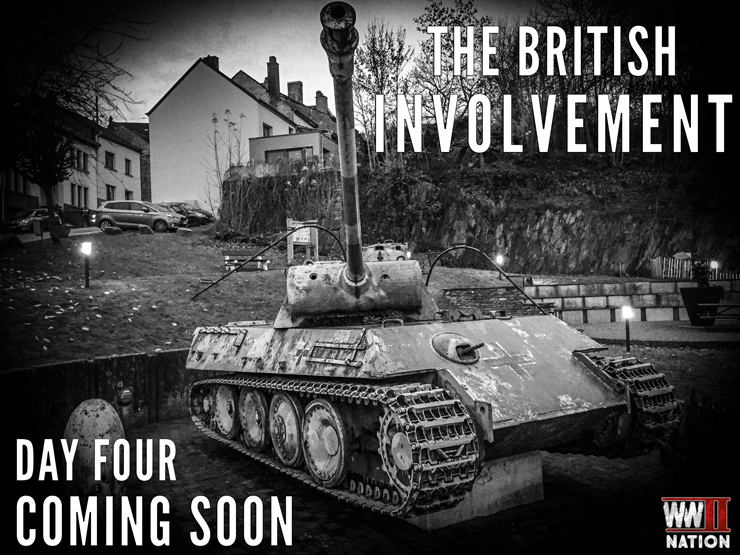 Sadly this event was only one of many atrocities carried out by Kampfgruppe Peiper against both US forces and civilians alike as they made their bloody march through the Ardennes. Today a monument stands opposite this field, on the Baugnez crossroads remembering each of those men killed here 72 years ago. From here we headed further East to the border between Germany and Belgium from which the Germans launched their attack on Saturday 16th December 1944. 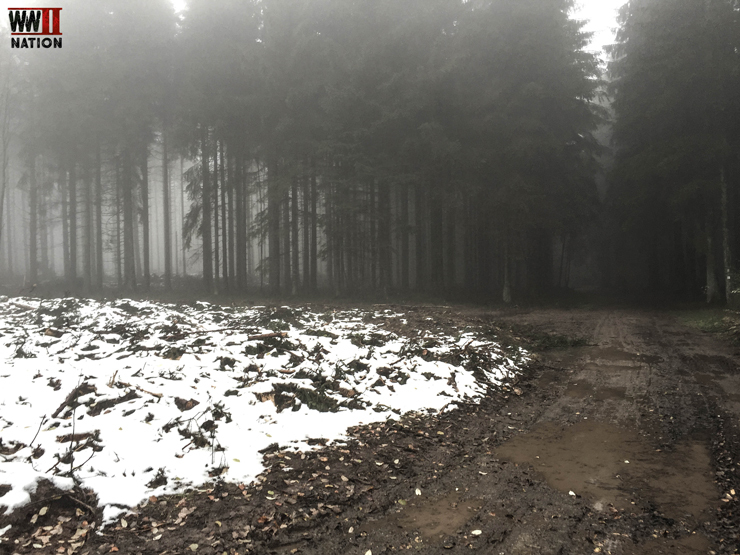 The conditions were very atmospheric when we arrived, fog and mist had descended around us and there was a light snow fall on the ground. 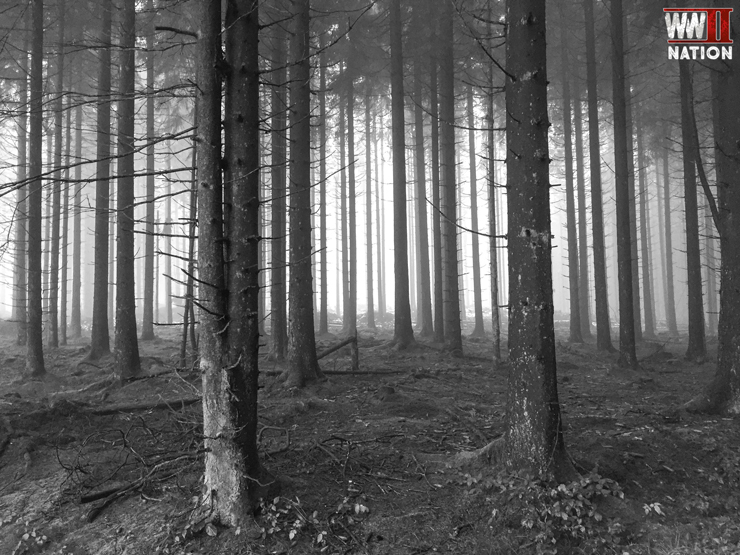 You can only imagine what the American troops who were dug in within these woods must have been thinking and feeling, unable to see more than a few yards ahead but hearing the enemy advancing towards them. A look at Rollbahn ‘A’. 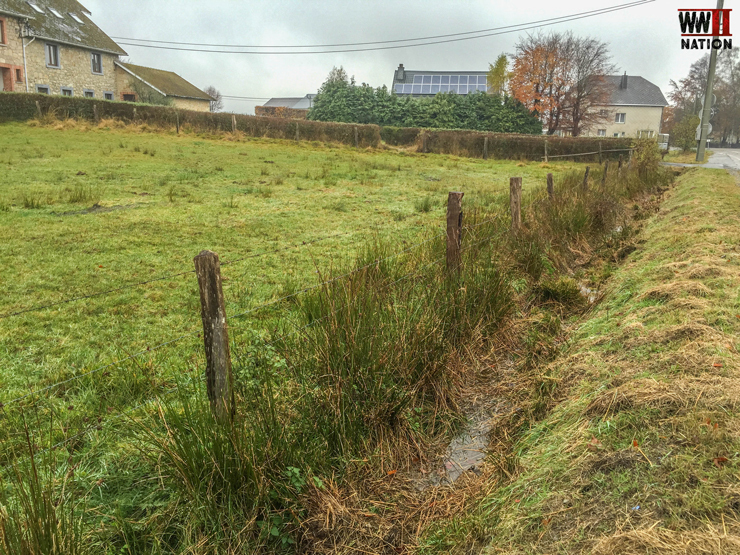 This small rural track was where the Battle of the Bulge first began in this area. 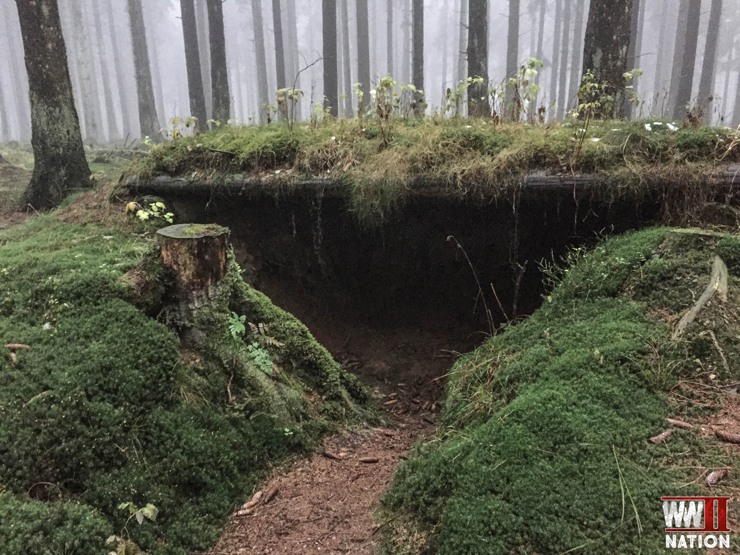 It was through here into the Krinkeltwald woods that the German troops and armour poured. Again not ideal tank territory given the tight confines, there would have been little manoeuvrability and as you can see even in the conditions when we visited the ground looked awfully churned up, you can only imagine what it would have been like with a whole Panzer Division trying to move through here. 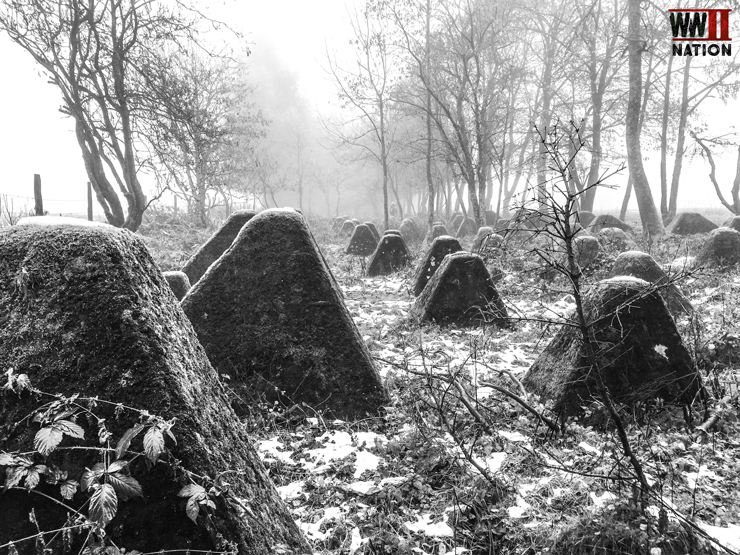 Hitler’s offensive of Herbstnebel would originate from the much vaunted Westwall. 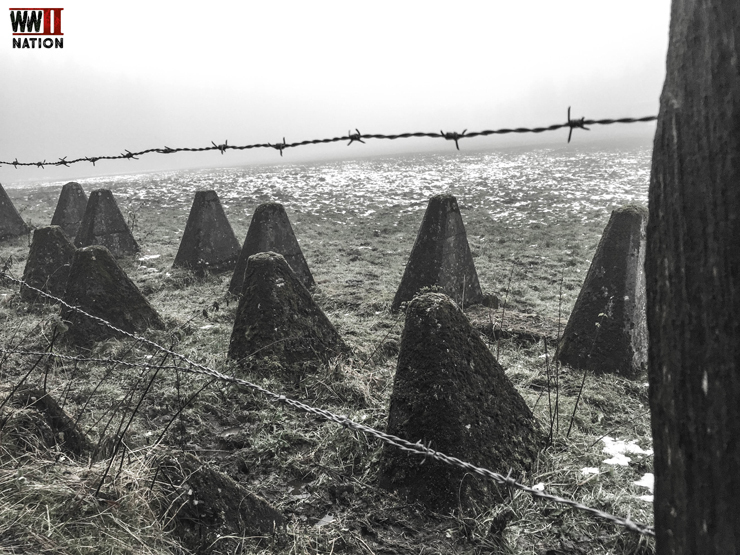 The Siegfried Line as the Allies called it had been a pet project of Adolf Hitler from the 1930s. It was partly as a propaganda exercise to demonstrate Germany’s building abilities, but also along with other massive building projects such as the Autobahn, helped aid Germany’s economic regeneration in the 1930s. 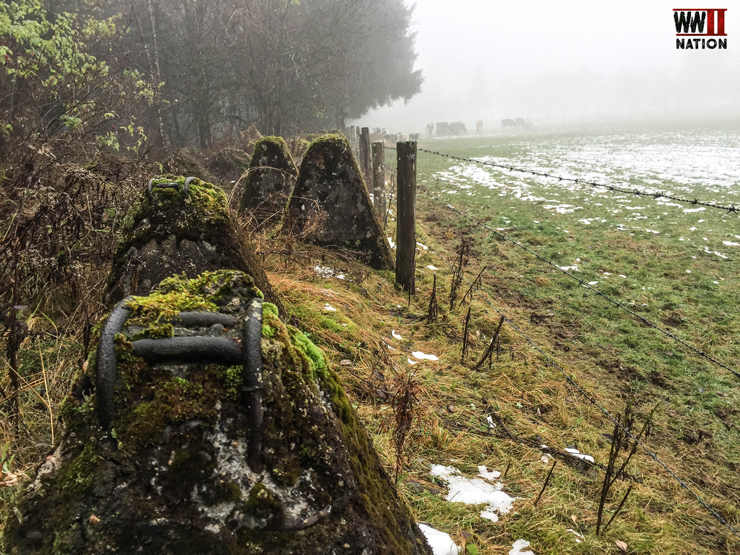 The Westwall or Siegfried Line as the Allies knew it, was a chain of fortifications, dragon’s teeth, barbed wire, anti-tank ditches and defensive positions which comprised more than 18,000 bunkers and stretched for around 400 miles from Holland to the Swiss frontier. It was an absolutely huge project and feat of engineering. Around 20% of Germany’s annual cement production and 5% of its steel output were allocated to this. Overseeing its construction was Inspector General for Reich Highways Fritz Todt and his organisation which utilised 500,000 workers in its construction in the late 1930s and it cost a staggering 3.5 billion Reichsmarks! Interestingly it was in July 1944, following the Allies invasion of Normandy in June, that Hitler ordered the Westwall to be re-armed, as much of it had been stripped with their occupation of western Europe. In some sectors, the Westwall itself would prove an initial obstacle and barrier that Hitler’s forces and in particular tanks would have to overcome even before they began their assault of the US positions. 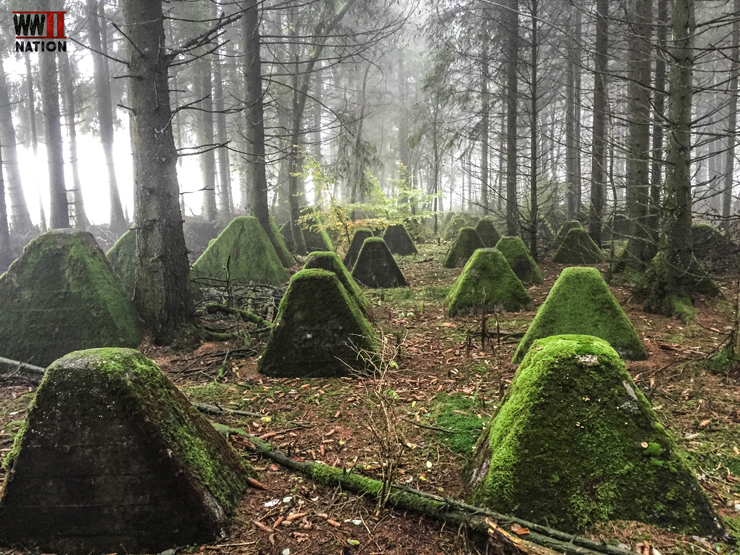 Where the presence of the anti-tank obstacles was known about in time, and because demolition work might alert the American defenders, the problem was solved by inserting special pins into the top of the dragon’s teeth. This allowed for struts and ultimately ramps to be laid over the top of these and allow on Null Tag for the vehicles to pass over these obstacles. 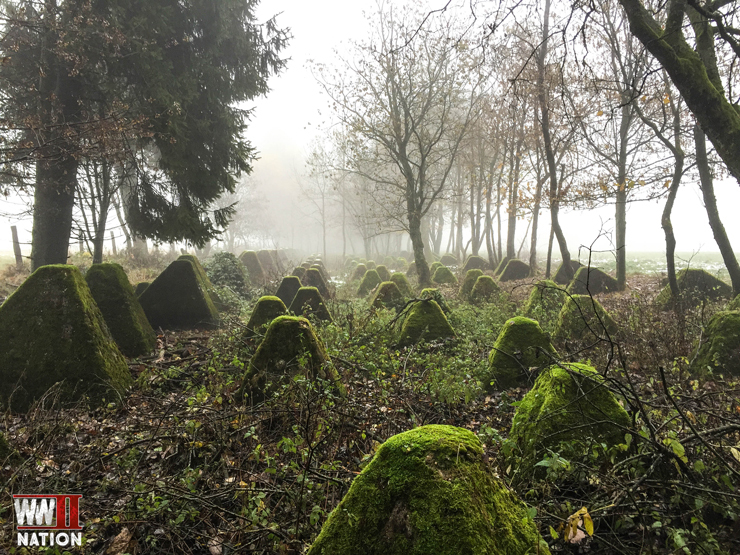 From the Siegfried Line we ventured into the woods of the Krinkeltwald in search of a few of the positions connected with the fierce fighting here in the opening days of the Battle of the Bulge around Krinkelt-Rocherath. 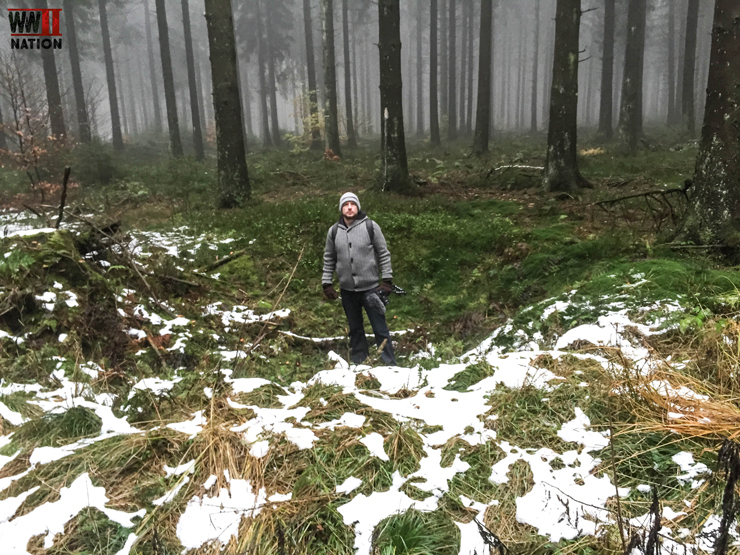 It was in these woods that the US 99th Division (or Battle Babies as they were nicknamed) felt the full force of the German assault, when the 277th Volksgrenadier Division attacked them on the morning of Saturday 16th December 1944. 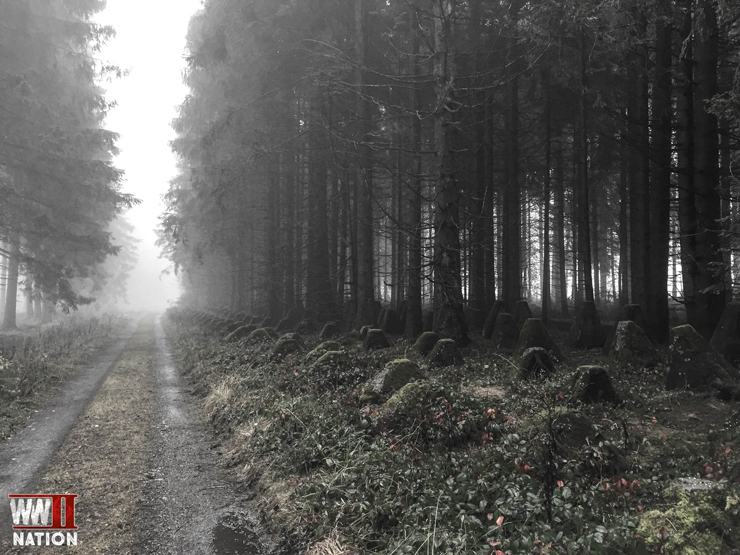 I had been particularly keen to try and locate Captain Charles MacDonald’s original positions for he along with other men from the US 2nd Infantry Division were rushed to the woods to help assist the 99th in holding off the Germans. And MacDonald goes into great detail about this action on the 17th December 1944, where he and his men hold off several successive waves of German infantry before being overwhelmed by German armour. Sadly with the light failing us, weather conditions worsening and unable to use our car, we did not manage to find his exact positions, we even lost our guide Michel at one point. But we did manage to find other positions connected with the fierce fighting during this period. Here Ross is standing in a bomb crater, most likely from an artillery shell. 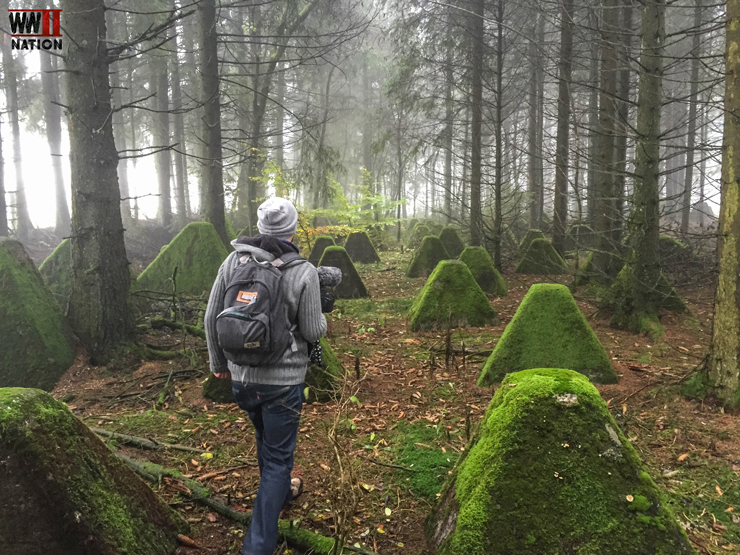 There is a section of defensive positions in the forest that has been excellently maintained and is under constant preservation, that we got to explore. This is an example of a US command post position which could typically house 4-5 men. An example of an American First Aid Post position. 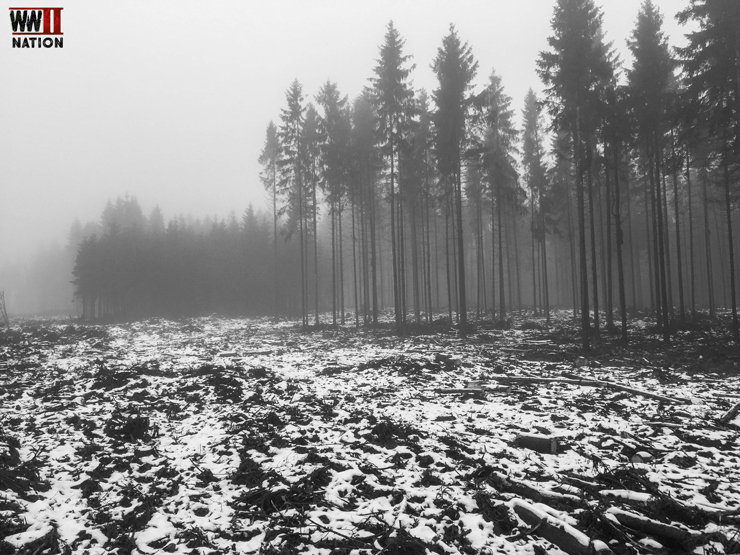 Casualties were high on both sides in the fighting for these woods. 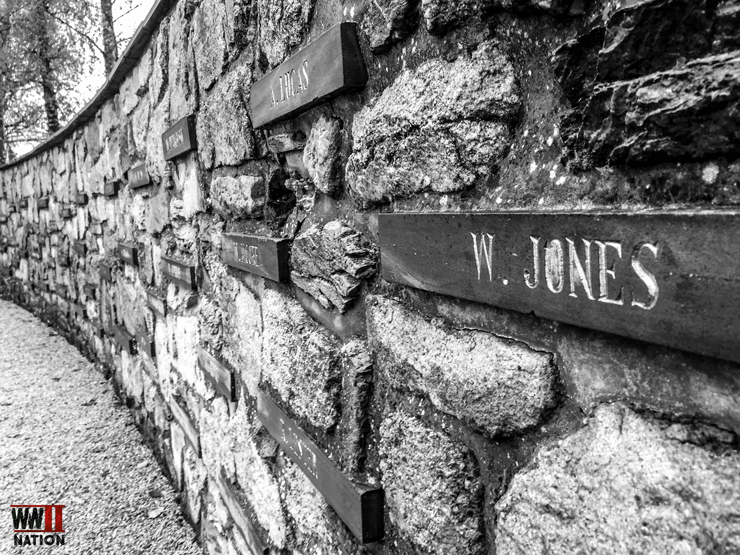 There were in fact 3 Medal of Honours awarded for the fighting in this vicinity in the first few days of the battle, which gives you some idea of the fierceness of events unfolding here. These included PFC Lopez, PFC William Soderman and also PFC Richard Cowan. 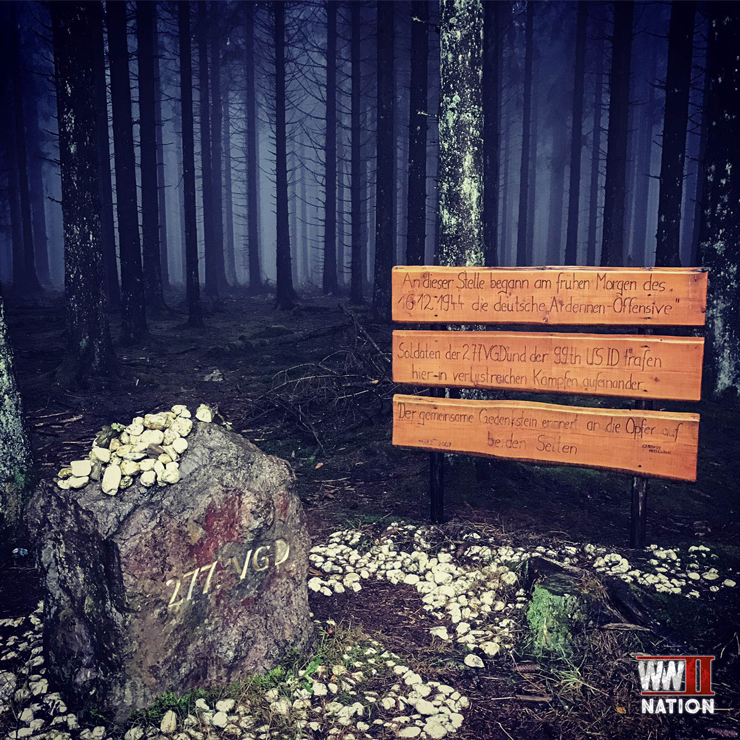 Today there is a memorial commemorating where the Battle of the Bulge began in this area and those two units from both sides who encountered one another in these woods on that fateful Saturday morning of 16th December 1944; the US 99th Checkerboard Infantry Division and the 277th German Volksgrenadier Division. 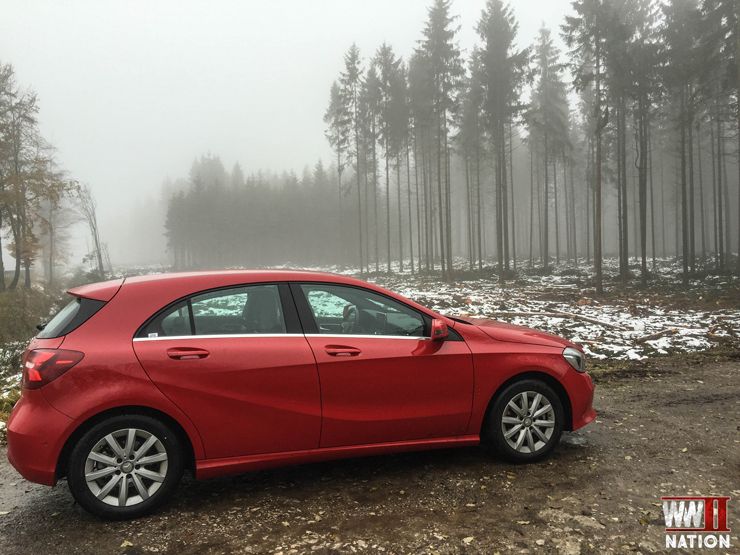 I hope you enjoyed our highlights from Day Three of our trip Exploring the Ardennes. 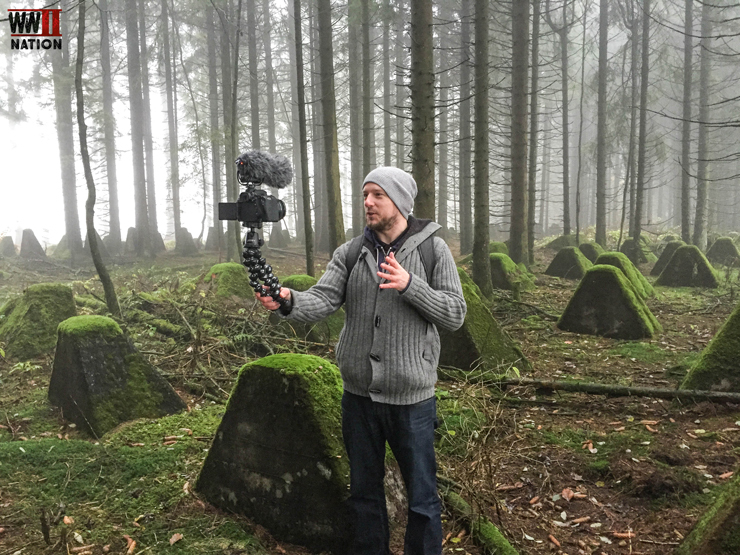 Our 2nd Vlog from this trip will be following this Friday. 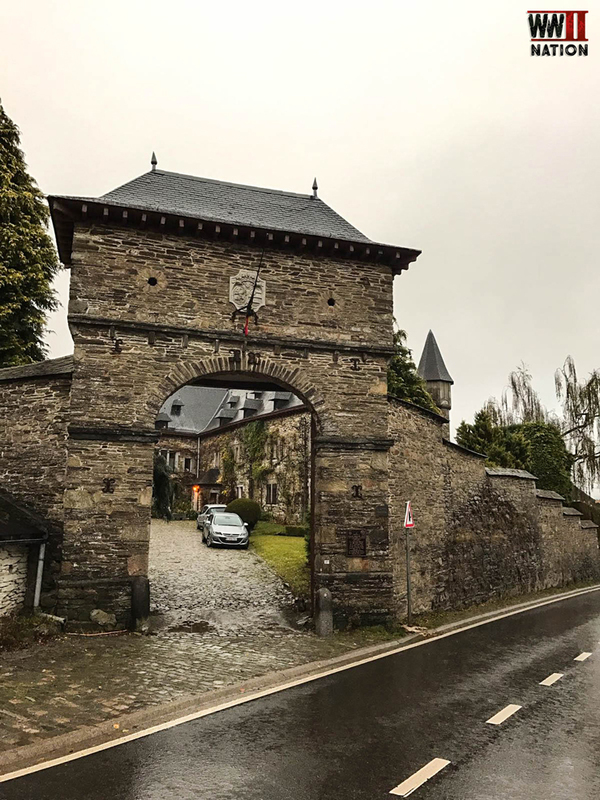 The Photo Journal of Day Four which sees us visit Bure to learn more about the British (and in particular the 6th Airborne Division’s) involvement during the Battle of the Bulge. 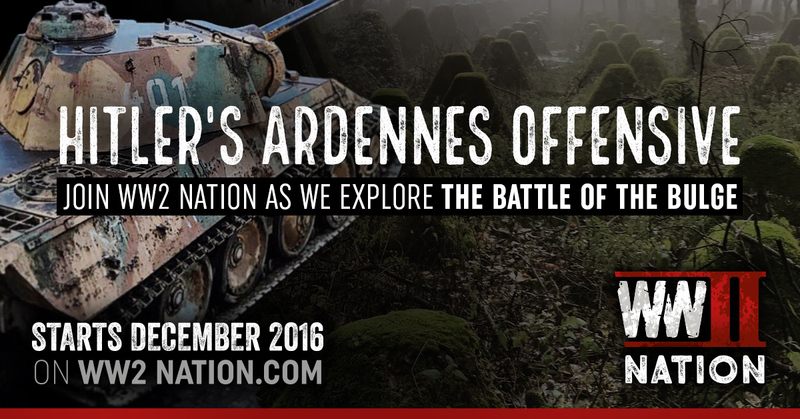 We also finish our day off at Houffalize visiting an original Panther Tank and the spot where the Bulge was finally sealed by the Allies. If you wish to find out more about King Tiger 213 (Königstiger) and its final engagement you can do so by Clicking Here. 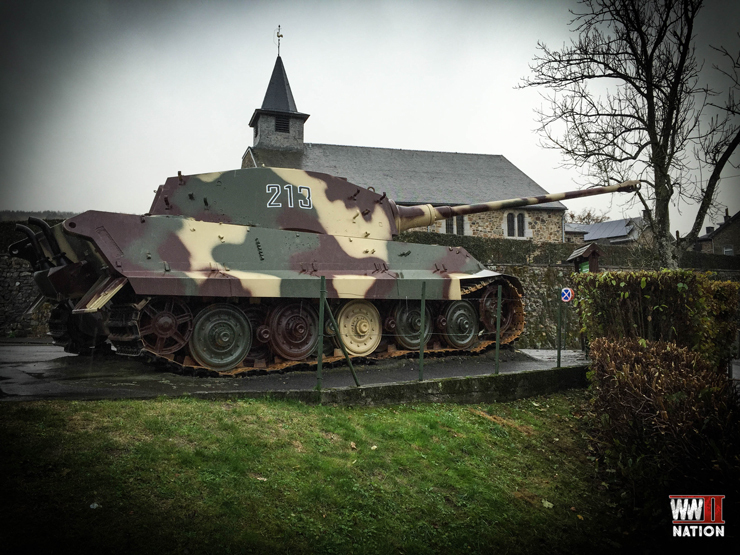 There is an excellent write up about the history of La Gleize during the Battle of the Bulge with archive photos on the December 1944 Museum, which I would recommend a visit to if you ever get the chance. Unfortunately much to my frustration we did not get time to on this trip, but this is definitely on my list of places to visit when we next return!